Playing with your dog is fun for both of you. But beyond amusement, games have a significant educational value for pets. To dogs, games are not only amusement. Through games, you can teach them different behaviours and contribute to their physical and mental development. But for all this to progress correctly, you must follow some guidelines. For a start, choose toys that stimulate their smell, tracking or catching. 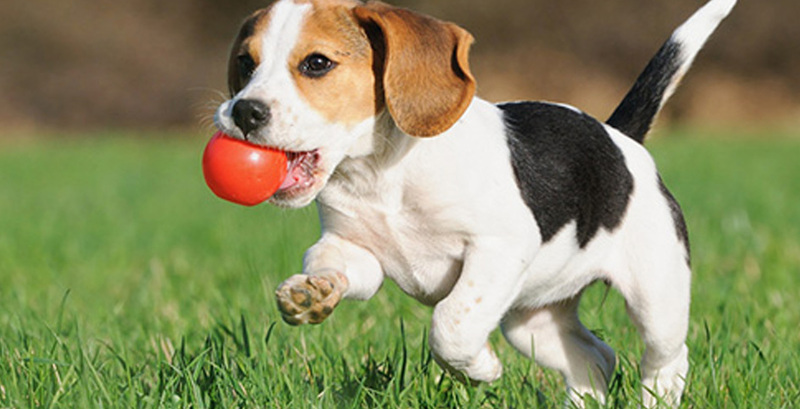 Toys that dogs can pull, hard balls and teethers are also appropriate toys. The best consequence of teaching puppies to enjoy nibbling on these toys is that this activity excludes other alternative behaviours which can be annoying to us, such as biting plants, furniture or shoes. Also, nowadays there is a wide variety of interactive toys to prevent our animals from being bored. Another excellent game that will tire dogs out is that of hiding toys or rewards for them to find. However, every time you give them a toy you must take into account some recommendations. Never chase them or cause them to chase you. If they pick up something forbidden, simply ignore them and go in the opposite direction. When they see that their action has not caused any reaction they will most probably stop what they are doing. Make sure that the objects are indestructible to prevent them from eating them and choking. Finally, do not forget that in order for dogs to abide by the rules, it is very important that everyone around them enforces them the same way. Take advantage of toys to train them without them realising.